I was following the New York City NYC Marathon earlier this November and man, the race was packed with runners. It would be awesome to experience running in another country! I was having this conversation last weekend with DJ Chloe of Mellow 94.7. We just talked about things we love like running and we were both dreaming of participating runs in other countries! Itâ€™s pretty easy actually, you just need to research for runs in different countries and sign up. Another way to run on another country is to join this yearâ€™s ING Run â€œRunning 20â€ in Manila this December 11, 2010. The runners who will participate the 20k run half marathon are eligible to join the raffle to join the next yearâ€™s ING New York City NYC Marathon 2011. ING of course has always been NYC Marathonâ€™s biggest sponsor. 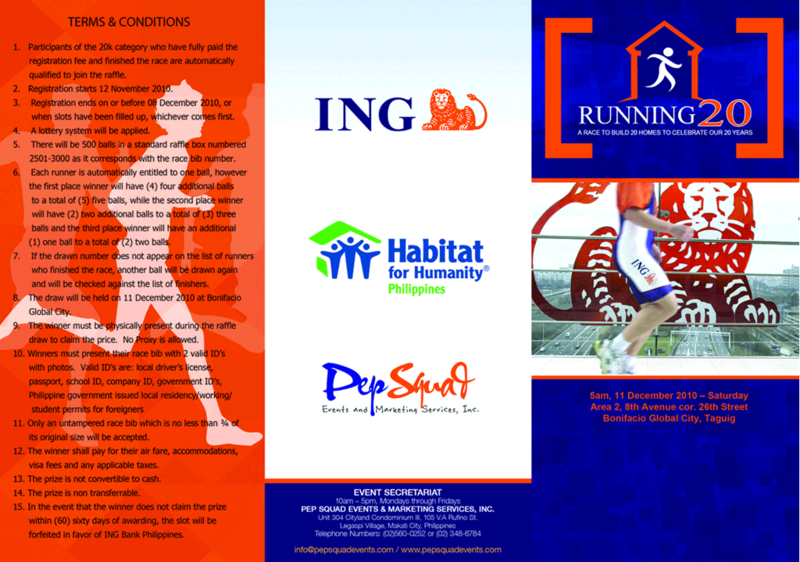 In celebration of 20 years in the Philippines, ING Bank in partnership with Habitat for Humanity, will hold a special running event to raise funds for the construction of 20 homes in Laguna. Registration is at Php500 for 3K/5K/10K which includes race Kit, RFID tag, singlet and giveaways. Registration fee for 20K is PHP1,000 which includes Rrace Kit, RFID tag, singlet and giveaways, finisherâ€™s shirt, finisherâ€™s medal and the eligibility to NYC Marathon Raffle. ING Running 20 / ING Run Registration here. Contact them for more details or log on to www.habitat.org.ph. Run for a worthy cause and together, let’s make a difference one home at a time! yeah… I wonder why they didn’t add 1km para half marathon nalang 🙂 are you joining? You have a fun blog!